If a relationship doesn’t work out, you have the right to walk out of it, with respect. All of us seek solace and comfort in a relationship. Our minds are mostly free of thought that may bring an end to these treasured relationships. But what do you do when the relationship is strained? Most friendships and relationships offer us powerful lessons in life. We gain life’s foresight and wisdom that holds us in good stead our entire life. When is it time to pull the plug on an unhealthy relationship? 1. When the pattern of behaviour does not change over time. They say destructive behaviour and negative circumstances often makes us resolute and strong. But this may not be true if the occurrences are regular and the toll on mental and physical health is high. No one deserves to be damaged psychologically or physically damaged. A destructive relationship should be given up on if the behaviour worsens and the circumstances do not improve even after repeated interventions. If one feels physically or emotionally threatened by a partner, suffering from anxiety and panic over their own security in their own house, being abused, beaten, thrashed or neglected, one must solemnly look for terminating the relationship. Believing that the stubborn habit of an abusive partner will change one fine morning is like trusting caterpillars to turn into elephants. Self-blaming and playing the role of a passive victim will only prolong the suffering. 2. You are always exhausted and never feel happy or even empowered. You cannot sustain relationships by being admissible all the time. That is the root cause of trouble. We often consent to terrible things at the cost of keeping the relationship alive. Relationships should be uplifting and empowering and life should not be about excuses and grievances. If you are not feeling inspired, respected, trusted and see no self-growth while being in the relationship, you may just walk out of the relationship. 3. The relationship often brings out the worst in you. This is a common occurrence and many women and men who are with their spouses or friends feel this time and again. If you are unhappy, you will be agitated and upset, belittled and often begin bad mouthing your partner. 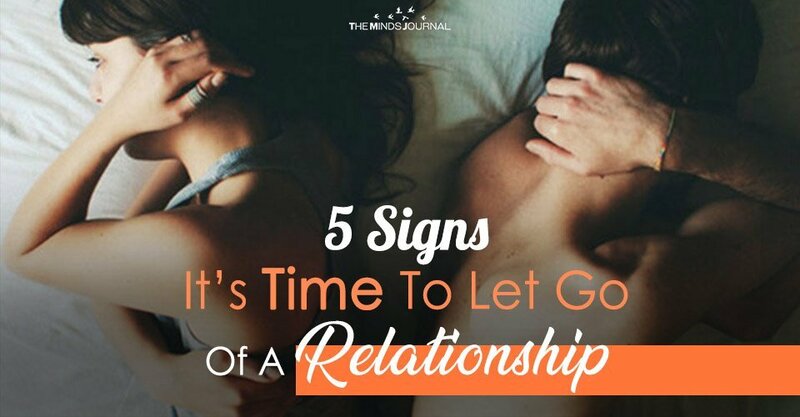 This is unhealthy – both for the partners as well as for their relationship. A positive and fulfilling relationship will help you rise up and feel empowered and not bitter and vengeful. If most of your partner’s actions directed towards you, irks you than encouraging you, you must consider walking out. 4. What stirs the passion in you and gives you fuel to get on with life is the reason for conflict. Partners are meant to appreciate their other halves. Even if both people have opposing views, it makes sense to support each other through trying times. When mutual support ends, conflict and arguments take place. This strains the relationship and conflict can never be a good thing for someone’s energy and confidence. Sometimes in a “relationship” the concept of “ones” beliefs is enough to derail a what can be something amazing. One pushes and the other pulls. Even if the foundations is solid, the negatives that is created over time over one issue can be a disaster. Once it is over, due to that one circumstance only time can prove what was the right choice. Yes, I agree it is a lesson. But it seems both think they are right, ultimately one has to be wrong. In time one will or both will not care. It’s a shame, but I suppose it’s down to our understanding on to what we think we know.